This photo was taken at Cathy and Andy's Deer Park Hall wedding. 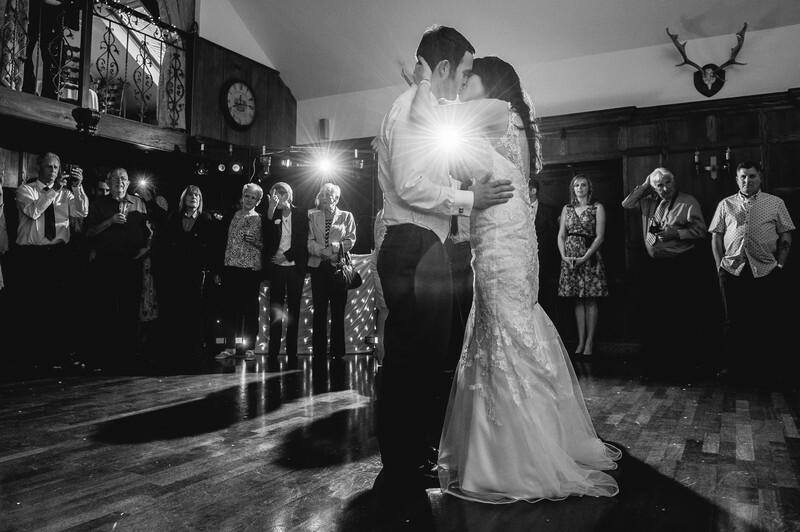 Deer Park Hall in Worcestershire is one of my favourite wedding venues, and I'm honoured to have been a recommended photographer at the venue for the last 6 years. The venue has a wonderful rear lawn, with a beautiful garden and stunning flower beds, but it's equally as nice indoors too. For Cathy and Andy's first dance photos, I went with my more traditional approach - Shooting against the DJ's booth, and using the disco lights to illuminate the bride and groom. To help add to this effect, I used an off camera flash and triggered it with a radio remote control. I got lucky with this image, as at the same instance I took my photo, one of the disco lights was pointing directly into my camera lens. What makes this image even better, is that despite how close the bride and groom are standing, you can see this wonderful starburst of light coming between the couple. I love this image in black and white, and it's often a good way to go with first dance photos as you sometimes get light colours that don't go well together!